Bill started off as a wild caught baby. He then was brought over to Canada by an australian couple who had him for about 18 years – most of his talking is with an australian accent and he goes wildly happy when he meets an Australian. When the couple moved back to Australia they weren’t allowed to bring him with them so he was then put into another home who had him for about a year, this was definitely NOT a good home – he was a seed addict, neglected and was then put into foster until my Megan’s cousin got him in approximately 1992. Megan inherited Bill from the cousin in 2007, he was approx 31 when she adopted him. Bill’s feet are deformed – the story that goes with him is that they’ve been that way since birth. Several of his front toes curl up and he has trouble grasping. 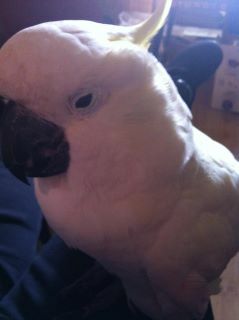 To compound this, he’s always been on a flat perch *only* which has created pink sore looking flat spots on his feet. One of his feet includes the bottom of his leg that comes down and touches behind the toe. Megan encourage Bill to walk around quite a bit and giving him differently shaped things to stand on. 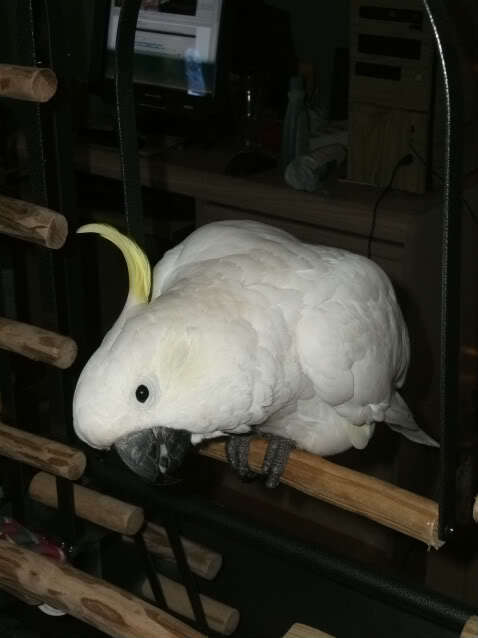 He still gets the flat perch at night, but the ability to be off of it more and to rest on other things to help strengthening up his legs and improving his grasp. Bill had what was thought to be a tumour on his chest. Megan’s vet has said they would keep an eye on it, but felt since it was benign and not interfering with anything yet, there was no reason to operate immediately. However Megan began saving for all the needed medical care that she realized her special boy was going to need. Jan 2008 Bill’s tumor became a problem and he was dropping weight. The fatty tumor had now become a secondary infection and was making it very difficult for Bill to take in any food. The vets ordered antibiotics and continued to watch and monitor him closely until they felt he was strong enough to undergo surgery. On Feb 6th 2008 Bill was sedated and surgery was done. What they original thought was a fatty tumor, turned out to be a small rupture on his crop that has been leaking fluid into the soft tissue for years. This growth went waaaaay back in and up his neck. The vet got most of it, but couldn’t get all of it. She says that what is left “looks like trouble”. The leaking fluid created a long mass that culminated on his chest. It was big. 1.5inches by 1 inch. She couldn’t get the last bit of it because it was resting on his thyroid and she was so deep in that she was scared she would do some nerve damage. The wall of the mass was almost a 1/4 inch thick. He has quite a large incision in his chest. She’s quite worried about the mass that she had to leave. It seems that this mass was all infected and probably he’s had a low-grade infection for years that his body has walled off. Bill was on antibiotics for about six weeks after surgery and getting him to eat had to be done hourly and only very small amounts. After he was healed, Megan began to notice that Bill was favoring one of his feet and again his weight was dropping. This was only a month or so after his surgery. Bill was back into the vet for testing and after a week plus of waiting, The core biopsy came back NEGATIVE for squamous cells or any other cancer. Even though this was not a diagnosis, Megan was still so relieved to hear that it wasn’t Cancer. 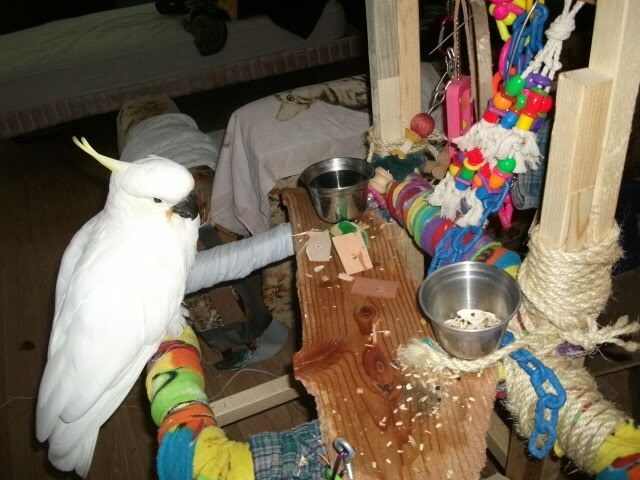 Since Bill had deformed feet, Megan had done everything possible to create new, good, comfy, soft, specifically constructed for cockatoo biomechanics perch. With this new standing arrangement his entire foot is bearing weight. He is unable to hang the back of his feet off of it. This caused swelling to start on his back pad and this swelling created a crease between the swollen part and the foot above it. Which, in turn, made his foot ‘scales’ crush and grow out wonky – looking like cancerous fronting. He’s not to spend much time on the couch itself anymore and Megan had to make him an arrangement that allowed him to hold on, but still hang his feet over the back edge. In less than one year of inheriting Bill, Megan had some huge vet bills. She worked three jobs to make sure that they were paid in full and never once asked for help. 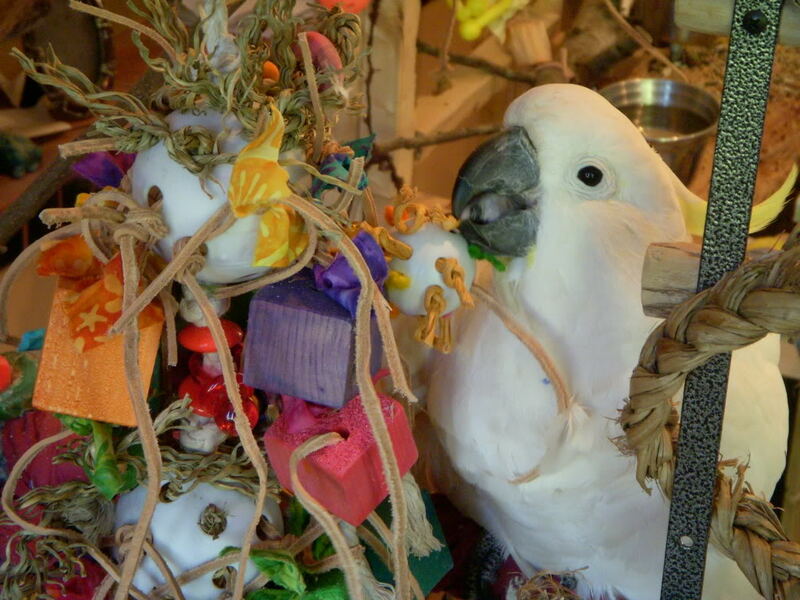 She has also shared this with many people over the years of how important it is to have fund set aside for your feathered or furry companions. One never knows when vet care may be needed and as responsible care givers it is our duty to be prepared. A couple of weeks ago, Megan noticed Bill’s appetite was less than usual. She immediately became concerned due to his health issues in the past. She phoned her vet immediately and began taking him in for testing. What they found was most likely fibrous scar tissue that has grown back from his surgery in 2007. Surgery in the same spot that was done before means the tissue is usually more friable, especially beside the scarring. Bill has not been eating for the past couple of weeks and so he is not strong now, which can mean surgery could be a considerable risk. Megan and Bill are in the hospital now, Bill is sedated and being fed intravenously. Tomorrow, late morning, they will start an endoscopic investigation. From there they will evaluate what needs to be done. The crop is pulled to one side, leading her to think that the original surgery site has adhesions that are pulling on it. The vet says that the barium is barely making it into the crop and that the stricture is above the crop and ballooning the barium out. She says that could be anything, it could be that something is creating a fold or kink in the crop, OR it could be a foreign object. 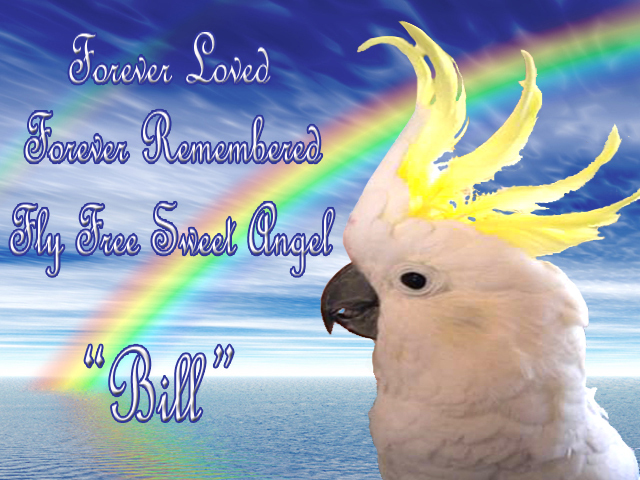 Bill is an amazing boy and he has touched the hearts of all who have had the pleasure of meeting him. He seems to understand those who are terrified of birds, and after meeting Bill…they all have said how he changed their opinion of birds. He is gentle and kind to all he meets. While he may have had a rough life, he knows compassion and shows it to all who come into contact with him. I want to thank all of those who have been praying for this very special boy and Megan. All of us who share our lives, understand how dear these precious little Angles are to us. They are not just pets, they are our family and children. 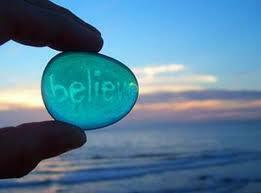 They are in our every moment of thought through out our days. They are our laughter and our tears. They are our hearts! 1956 West Broadway, Vacouver, BC V6J 1Z2. Ph: 604-734-5100. FaxL 604-734-5110 Thank you all. You can also donate to Megan’s paypal thespinnychick@gmail.com. I Know these vet bills are mounting for her and while Megan would never ask for any help, I am going to do so for her. The ferry she had to take each time she takes Bill to the hospital costs 200.00 round trip. The last time Megan had surgery for Bill, she worked three jobs to pay for his medical expenses. So even if you can only afford a dollar, it will all add up and help our Megan and Sweet Bill very much. On March 20th at 4:55 Bill could no longer battle his illness. He managed to climb up out of his bed and leaped onto Megan’s chest. He laid his head against her and gazed up into her eyes. He quietly went to sleep for the last time, in the arms of the person who he loved most in the world. Crying while I read but oh so thankful that you are doing everything possible for him. I usually do not pray but for him I will!! Hugs. And a special hug for Bill. Deborah, thank you for this writing Bill’s story! What a thoughtful and compassionate way to share Megan and Bill’s story. Thank-you Deborah.Hugs, prayers and a donation on the way for them. My thoughts & prayers are with the whole family, and I hope Bill pulls through. I’ll be helping as well. thank you, Deborah for writing Bill and Megans story. they are blessed to have each other. my heart goes out to Megan and her sacrifice and love is unbelieveable and an example to everyone, including myself. Im not employed right now, but I will definitely find some cash to help out. God Bless them and you. Oh, Megan! I’m so sorry to hear about Bill’s passing. You must be devastated. As for Bill, well, he was totally and absolutely loved until the end. We should all be so lucky. Take good care. I miss him so much. I just read this again. He was my darling. One of the true loves of my life. I will always have a place in my heart that cries for him. He will always be with you and someday you will be together again hun. Angels have a way of hanging out on the clouds to watch over us until we can be together again!